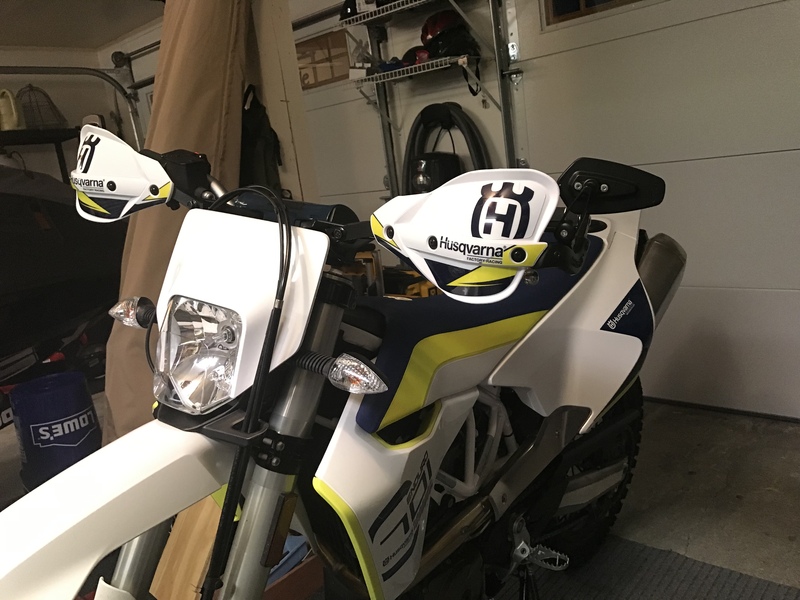 Cycra Handlebar Clamp Mount (HCM) Handguards are the perfect choice for new Husqvarna models equipped with preload adjuster caps. Standard bar mount handguards interfere with the fork cap adjuster bar and take up valuable handlebar real estate. Moving the mounting point to the top handlebar clamp solves a variety of problems while providing a more solid mounting point with easier installation. Includes new set of handlebar clamp hardware. Much better than the stock handguards. Install was pretty straightforward, Cycra has some great videos on their website to help if you need. I also installed some CRG arrow mirrors with the Rottweiler mount. Overall I really like the setup. My only complaints was that the stickers were kind of coming off or bubbled in a few areas... just had to hit it with a little heat to work it flat against the handguard. The self tapping screws are also not the greatest... didn\'t have any issues, but could see how they could get stripped pretty easy. Just make sure you have everything lined up. the replacement handelbar clamps are not one piece therefor the bar can twist on the triple clamp ,not a good thing during a race. Very happy with these handguards, this was an easy install and the fit and finish was near perfect*. I installed the CRG mirrors with Rottweiler Performance bracket and got just the look and functionality I was wanting. The plastic shield is a bit larger than stock and provides more protection from wind and branches. The finished product is very stout, sturdy and should provide additional protection in the event of an crash.\n*My only criticism would be that the decals were not 100% adhered, there was a small area on both handguards that required me to use my heat gun to soften the decal and stick it the rest of the way. A minor inconvenience.